Use the Stocks app on Apple Watch to see info on the stocks you follow on your iPhone. Follow the market. 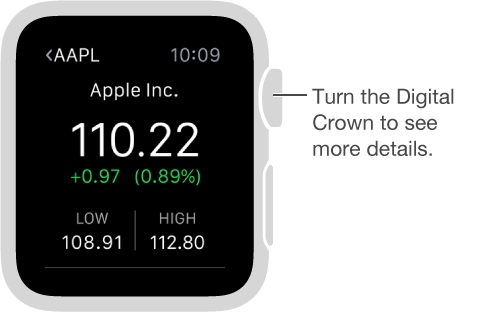 To browse your stocks, open the Stocks app on Apple Watch. See details about a stock. Tap it in the list, then turn the Digital Crown to scroll. Tap the performance graph (or the time indicators below it) to change the time scale. Tap < in the upper left to return to the stocks list. Add, delete, or reorder stocks. Add, delete, or change the order of stocks using the Stocks app on iPhone. Changes you make there are reflected on Apple Watch. Choose the data you see. Open the Stocks app on iPhone, then tap the Points Change for any stock to see Percentage Change or Market Cap. Switch to Stocks on iPhone. While looking at the Stocks app or Stocks glance on Apple Watch, swipe up on the Stocks icon in the lower-left corner of the iPhone Lock screen.